Halleluyah Nigeria, in conjunction with Nigerian churches and the Full Gospel Business Men Fellowship, will on Thursday commence 400 hours non-stop praise and worship to celebrate President Muhammadu Buhari’s recovery after over 100 days of medical vacation in the UK. The programme will also celebrate Nigeria’s exit from recession and mark the 57th independence anniversary of the country on October 1. Over 140 church choirs and several gospel artistes will be part of the event, which takes off September 14 at 8am and will end at midnight to usher in October 1. Last year, the group held 365 hours of “non-stop” praise to mark the first anniversary of Buhari and seek God’s help for the administration and the country to overcome the economic recession. 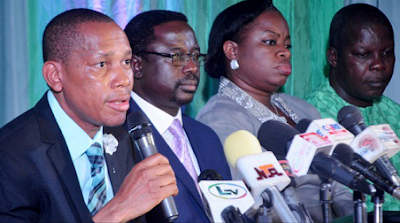 Oluseyi Malomo, a pastor and chaplain of Aso Rock Villa Chapel, said the first 343 hours of 16-day programme will take place at Sharon Ultimate Hotel in Abuja while the last 57 hours will be held at the National Christian Center. Funding comes from voluntary donations from individuals and members of the Christian Association of Nigeria (CAN), he said. Malomo said “the spirit of appreciation is the motive behind this event. We are taught in all our cultures and faiths the principle of thanksgiving, to show appreciation for good deeds done to us. This is because appreciation enhances more benevolence towards him who is appreciative. “Let us all be appreciative to God who has not just kept us together for these 57 years, but has blessed our nation with such resources of enviable potential of land, minerals and great and resourceful people.